My first reaction was the same as that of many others: How could someone make an argument riddled with so many flaws of logic and science? They must have been morons! After thinking about it more my questions changed to: How could someone make an argument riddled with so many flaws of logic and science? They must have been smartasses! I thought it was a bit suspicious that it was the image itself was being circulated and not some site hosting it. No attribution on the image makes it hard to find its source and know who to blame. I thought it very suspicious that the author could handle multiplication and division of numbers in scientific notation, but somehow completely missed learning about the water cycle in school. 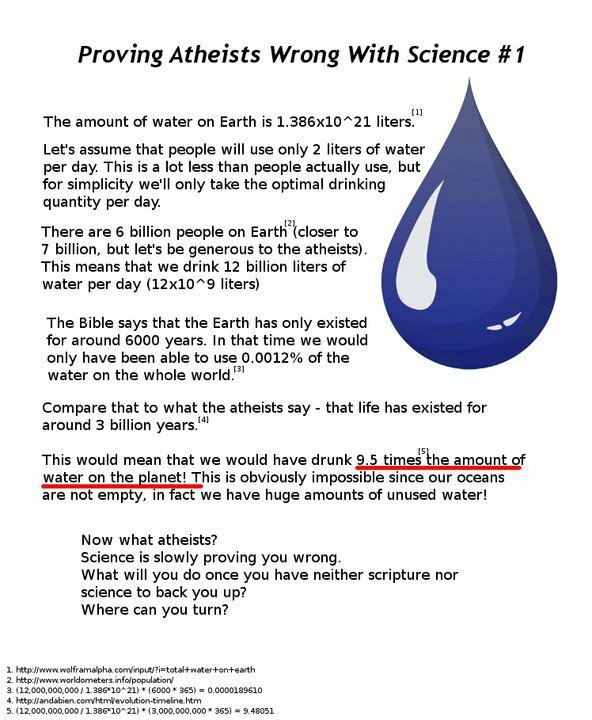 I'm now convinced that the image was created by some trolls as a parody, and not by serious Young Earth Creationists. However that hasn't stopped many people from laughing at it, and I'm sure there was derision in some of that laughter. Most responses were of the form "LOL don't they know about peeing?" A small few used it as a springboard to mount attacks against Creationists. This phenomenon where people cannot distinguish between extremist views and parodies of such views is so common on the Internet that there is a name for it: Poe's law. In this particular case I was able to sniff out the parody even without the smiley-face, but I may not be so lucky next time. One should be careful of taking extremist viewpoints from anonymous or pseudonymous sources too seriously, as you risk fighting a position that nobody seriously holds. Beyond the parody value, I think the argument is potentially useful as a critical-thinking exercise for middle school children (grades 7-10 or thereabouts). Identifying flawed logic in arguments is an important skill, and I'm not sure that modern education systems do a good job of teaching it.